The flood situation in Assam worsened today as four more people lost their lives, taking the death toll in the region to 17, officials said. 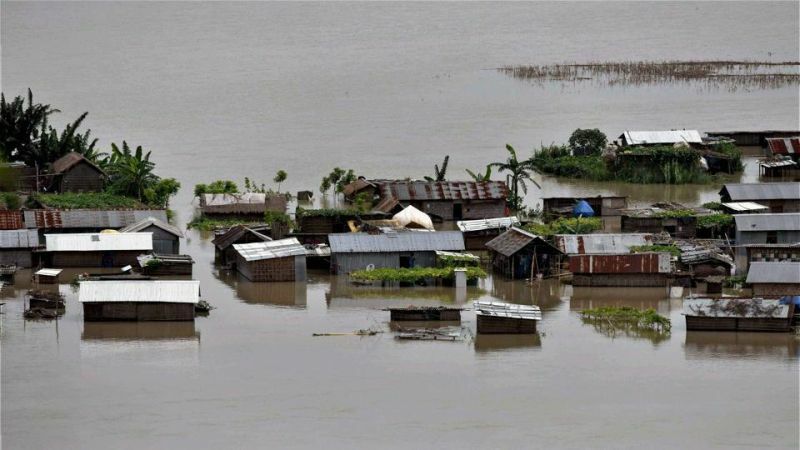 Although the situation improved marginally in Tripura and Mizoram in the past 24 hours, one more person died in Manipur from flood-related incidents. According to the Assam State Disaster Management Authority (ASDMA), four persons lost their lives in flood and landslide related incidents during the last 24 hours. While one person each died at Sadar and Lakhipur revenue circles in Cachar district, one person lost his life at Lanka in Hojai, it added. Heavy rainfall triggered landslide at Mahur, Harangajao, and Maibang under Haflong revenue circle in Dima Hasao, where one person lost his life, the ASDMA said. With this, the total number of persons losing their lives has gone up to seven in the first wave of flood this year. The ASDMA said over 4.25 lakh people have been affected in Assam's Hojai, Karbi Anglong East, Karbi Anglong West, Golaghat, Karimganj, Hailakandi and Cachar districts. Karimganj has been the worst-affected with over 1.95 lakh people, followed by Hailakandi with almost 1.89 lakh people. Currently, 716 villages are under water and 3,292 hectares of crop areas have been damaged, the ASDMA said. Due to landslide between the Bandarkhal and Damchara station, rail movement continued to remain suspended in the Lumding-Badarpur section, Northeast Frontier Railway Chief Public Relations Officer Pranav Jyoti Sharma said. The ASDMA said authorities are running 213 relief camps and distribution centres in five districts, where 1,00,010 people have taken shelter. Nearly 350 people have been evacuated to safer places during the last 24 hours by the SDRF and NDRF personnel from Karimganj, Hailakandi and Cacahar. Landslides have taken place at three locations in Guwahati city, but no casualties has been reported so far. Currently, the Brahmaputra at Nimatighat in Jorhat, while Barak at AP Ghat in Cachar and Badarpurghat in Karimganj are flowing above the danger marks. Other rivers like Dhansiri at Numaligarh in Golaghat, Jia Bharali at NT Road crossing in Sonitpur, Kopili at Kampur in Nagaon, Katakhal at Matizuri in Hailakandi and Kushiyara at Karimganj town are flowing above the danger marks. In Manipur, one person died in Imphal West district, official sources said. However, the intensity of rainfall decreased in Imphal this morning, but the situation was yet to improve in the valley districts of Thoubal, Imphal West and Bishnupur, they said. A fisherman drowned in a swollen river in Imphal West district yesterday, a report issued by the Relief and Disaster Management Department noted, adding that more than 1.8 lakh people have been affected by the floods. The number of damaged houses across the state has increased to 22,624 yesterday from 12,500 on Thursday, necessitating the setting up of 48 new relief camps, it said. 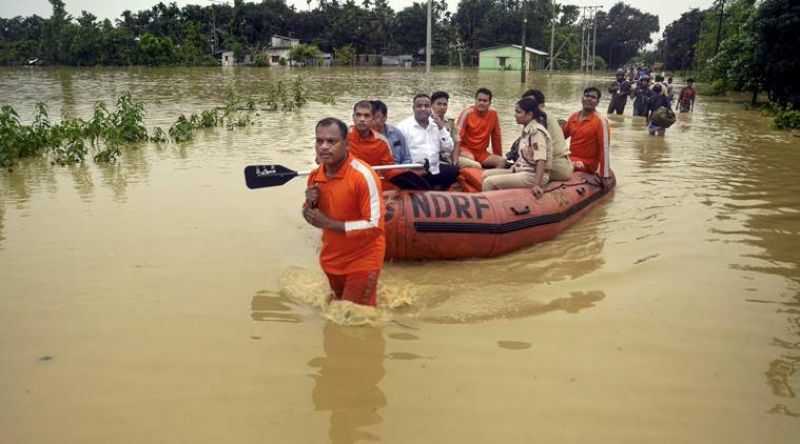 The flood situation has slightly improved in Tripura even as over 40,000 people continue to remain stranded in 189 relief camps across the state, the sources said. The flood situation also improved in Mizoram today with the water level of river Tlawng and Langkaih receding, officials said. Disaster Management and Rehabilitation department officials said though the water level of Tlawng and Langkaih river in Lunglei district has started receding, 500 families were displaced and a number of houses were still under the water.